Hi everyone – tonight the weather again looks great!! We will be having Super Burgers and Sausages post match/training/Milo, so please come upstairs to share a bite to eat, cold drink and to hear what our children have been up to!! In August/September 2017, our (then) new Club Head Coach Rob Ferdinands (Level 3 Accredited), developed and ran the first Nunawading Cricket Academy. This was aimed at our older U16/U18 Juniors. Tonight in our Club Rooms, you will see we are displaying the Framed #1 Nunawading Cricket Academy Shirt, together with photos all graduates. At this stage, exact dates have not been set, however we are looking to run the sessions in late June and through July (after the winter solstice – when we are starting to think cricket again)!! At this stage, sessions will be on a Monday, Wednesday or Friday evening. Different sessions will only run if suitable numbers are registered, so it is important we start to capture expressions of interests now. Tonight in the Club Rooms, there will be forms you can fill out to express your interest in a specific program (this is not a commitment). Further details, including proposed costs, will also be available tonight. This is a great opportunity. Rob has spent a great deal of his own time this season working with a number of our Juniors, and the benefits are obvious. Once again, we thank Rob for all his efforts. 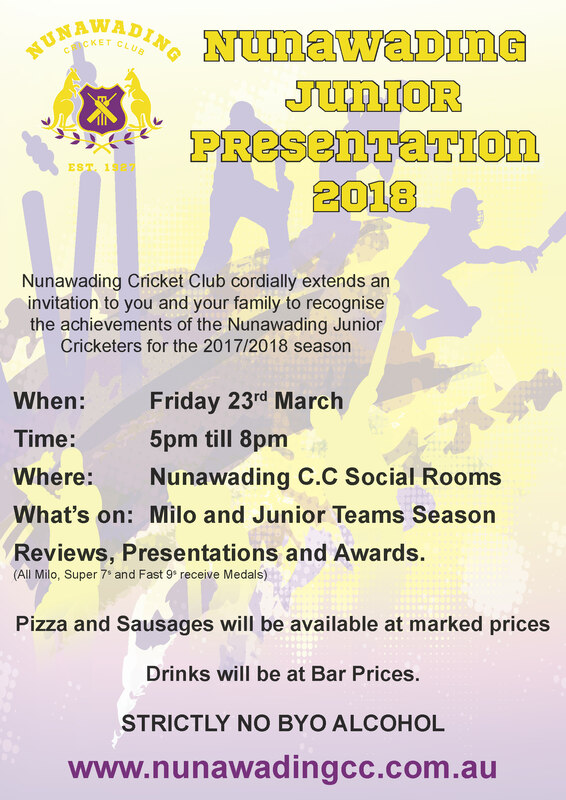 Friday 23 March is the evening we celebrate another great season at Nunawading. Please keep this date free!! Invitation attached. · Images of photos are not available to view. On saying that, when the photographer took the photos, not only did she show parents who were close by what they looked like, as a professional photographer, Jo has ensured she has taken quality photos. Any questions on how to order, please refer to my previous emails – or let me know. Special thanks to all the Junior Families who attended a great night last Saturday. As always it was a massive success!! Dench Meat and Chicken are great supporters of Nunawading. Whether it be providing Nunawading with great meat at discounted process, preparing the Saturday Night Meat Tray for our seniors, or providing one of the bigger donations for the Trivia Night last week, Dench have worked with us for many years. If you are at Forest Hill, please pop in and try their huge variety – you won’t be disappointed. Let them know you are from Nunawading CC and that you are grateful for the support.